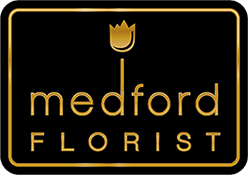 Medford Florist & Gift provides flower & gift delivery service to the following areas and zip codes in New Jersey: Our local delivery area includes the towns of Medford, Medford Lakes, Marlton (also known as Evesham), Mt. Laurel, Hainesport, Lumberton, Southampton, Vincentown, Tabernacle and Shamong as well as areas known as Evesboro, Fairview, Lake Pine, Indian Mills, Medford Farms, Red Lion, Hampton Lakes, Leisure Towne, Rancocas Woods and Springville. All these locales are within zip codes 08036, 08048, 08053, 08054, 08055 & 08088. * The delivery charge is a one-time only visit to the location you provide. Further charges for delivery accrue if the location information you provide is incorrect and/or delivery is not feasible at our time of arrival at the delivery location you provide, regardless of the reason, including weather. If your delivery location requires travel on un-made roads et cetera, additional charges may apply ... contact us for details. * If you become aware of a change in the delivery locsation having placed the order, kindly advise us by phone - 609 654 8338. * Delivery charges on Thanksgiving Day, Christmas Day and New Years' Day are $20.00 per one-time trip to the delivery location within our delivery area, described above. * With the exception of funeral deliveries for a viewing and/or service, if you request a specific delivery time or time frame we will try to fulfill this where possible but are unable to guarantee this, particularly at major floral holidays. * We require the current telephone number for the recipient, other than for deliveries to funeral homes. This is especially necessary in actual or forecast weather conditions difficult for fresh-cut flora and plants. Failure to provide a current, working, telephone number for the recipient may result in a delivery delay and a circumstance outside of our control. The provision of your contact information for the recipient, unless you live in the same dwelling or if delivery is for a business location where you also work, does not facilitate the delivery of your order. No telephone number for the recipient is used unless necessary for the delivery. By placing an order on our website you acknowledge and accept the above delivery terms & conditions. Hand-delivered, Monday-Saturday throughout the area. We also deliver on Sunday by especial prior arrangement & ask you to 'phone for information.